2004 marks the centenary of two events directly linked to two people who, even if they did not have the privilege of seeing the resurrection of the Jewish State, nevertheless have strongly influenced Israel’s recent history: Theodore Herzl, who passed away on 3 July 1904, and the settlement in 1904 of Abraham Yitzhak Kook, the first Ashkenazi Chief Rabbi of Palestine. These two greats had opposing views of Zionism. Herzl advocated a Jewish State that only addressed the material and secular needs of the Jewish people, whereas Rabbi Kook supported the spiritual dimension of the national rebirth, thus becoming the father of the National-Religious Movement. Both these schools of thought have strongly influenced Israeli society. The debate taking place today in the country, which has ramifications in both the academic world and political life, traces its origins to the differences of approach of these two Jewish thinkers. It follows that one of the most important subjects currently being debated in Israel and the Jewish world is the definition of Jewish and Israeli identity. 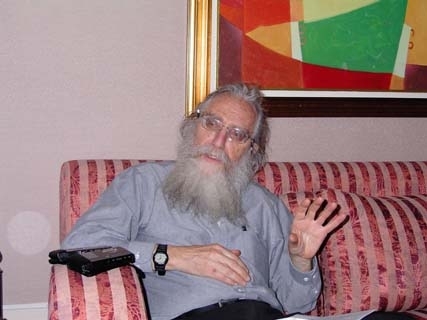 To enlighten us on this subject, we met Professor SHALOM ROSENBERG, a philosopher and Director of the Institute of Language, Literature and Art at the Hebrew University, Jerusalem, who also holds a chair at Touro College, Jerusalem. We are currently living through a fundamental debate that will determine the future of Israeli society. What, in your opinion, are the main issues in this crucial discussion? It should first be noted that we are hearing a whole range of ideas, from the simplest to the absurd, by way of the reasonable. The lobby promoting the theses known as Post-Zionism or Post-Modernism (which question Israel’s Jewish identity) has a major influence in the arts. This is a movement whose ideas are opposed to the well being of the Jewish people. It should be clearly understood that the result of the current debate, which is crucial for Israel’s identity, is entitled “a State for all its inhabitants”, and not “a Zionist State”. It is not simply sufficient to have a Jewish State today, but to keep it as such in the future, which is not at all certain. This question concerns not just Israel, but all Jewish communities throughout the world. We are at the core of the new definition of Zionism. If this term had as objectives the establishment of the Jewish State and the promotion of immigration, the fact is that these no longer suffice to maintain a Jewish State. Zionism must expand its definition, in order to maintain a stable balance between the State of Israel and the Jewish People. We are living in a strange period, where two currents confront one another. On the one hand there is globalization, which attempts to erase specific identities and create some sort of general leveling out, which means the abandonment of loyalty to each of these identities. This is about creating an identical, universal status for all of humanity, which would imply the end of history of mankind following the collapse of the Soviet Union. On the other hand, we are in the midst of a clash of civilizations, where Islam is confronting the West. In Israel, we find ourselves between the two movements and that is where our Jewish and Israeli particularity plays a special part. In practice, as Israelis we are perpetuating what is special about the Jewish condition, this bifurcated condition that has been defined by our Sages and that characterizes our independence in our interaction with other peoples and civilizations: Am levadad yishkon – a people who dwells alone – ostracized, marginalized, ghettoized, victimized but also introverted. By the same definition we are also Or lagoyim – a light unto the nations, a barometer, a warning bell and a model. It is essential that we retain our particularity and our Jewish identity, at the individual, political and national levels. Do you not think that some of the other debates that are agitating the country, such as the division between the religious and non-religious, the left-right divide, particularly in regard to the continuity of a Jewish presence in Judea-Samaria and Gaza, are not as important as the definition of identity? It is true that the issues you raise are making waves, but they do not affect the fundamentals or even the roots of the State in the way the definition of Israeli identity does, and the involvement of Judaism in this definition. The basic question is to know how to define Jewish identity, especially in Israel. It is based on three pillars: the religion, the State and what is called “peoplehood”, which includes both ethnic identification and a certain number of philosophical and ideological concepts. There are no other issues for determining Jewish identity. There are those who judge Judaism exclusively by religion and prayer, others who have only a national feeling, and a third category that is unconcerned about either of these but rather draws its belonging to the Jewish people from antisemitism or just morality. Lastly, there are those who feel Jewish through their roots, but who have no affinity with the knowledge and practice of religion or with the Jewish State. It must be understood that Jewish identity is a multidimensional phenomenon and that the fact that someone identifies with one of the three pillars mentioned previously does not exclude also being close to another, and in fact a mixture of all three is quite common, with one of them likely predominating. This is a totally subjective issue in which each of us finds his or her place somewhere within the triangle I described. In parallel, it is the tensions that exist between these three sides that feed the national debate. Yet we draw our strength from the fact that we have managed to establish a modus vivendi that leads each trend to develop simultaneously and independently within a common framework. I therefore think that the identity of the majority of Jews in Israel is made up of the common denominator that exists between State and nation. Do you believe that we are involved in an ideological debate whose purpose is to define whether Israel should be a Jewish State or a “State of the Jews”? The debate is more serious and more basic than that. In fact, I sincerely believe that the two ideas you mentioned can live side by side, and that questions of Shabbat, “Who is Jew” and others, which regularly crop up in the press, will find solutions acceptable to all. However, I fear that we shall be faced with another danger, the progressive creation of a State where Jews can live, but which is not made for them. Let me explain myself. The “marriage contract” binding Israel with the rest of the Jewish people is today defined by the Law of Return. No other western democracy defines the citizenship of the majority of its nationals by their religious affiliation. This approach is problematic and includes various contradictions, yet it is only in this way that we define Israel as being a country for the Jews. Now there is today in Israel a fringe of extremely cultured Israeli society, part of the so called “opinion makers”, in the media and the intellectual world, that wishes Israel to be some sort of neutral entity, without a Jewish identity, not to say without any identity at all. This is in fact a retrograde idea, advocated in the early years of the State by the Israel Communist Party that looks to some sort of functional state devoid of ideology. How do you propose combating this phenomenon, which appears to be gaining strength? One of the Israeli army’s doctrines goes like this: if you want something for a year, plant wheat; if you want something more durable, plant trees; but if you want something permanent, you must educate people. It is not possible to work with a short-term vision. We, the educators and thinkers, both in Israel and the Jewish world, can and must to everything to raise generations fully aware of their Jewish identity, who will not be tempted by nihilist theories. Such an enormous educational enterprise cannot be left just to the schools, but must also be supported by television, theatre, cinema and other media. However, all this is connected to events outside of Israel and the Jewish people. Since 9/11 there has been a new way of thinking. Intellectuals of every shade have started attributing increased importance to national identity. This is not yet the case in Europe, but I have good reason to believe that we are starting to feel some positive vibrations in Israel. There remains a fundamental question. As a western democracy located in the Middle East, Israel is a foreign body, not to say an unnatural fact. It is not a question of rendering the way of life more eastern, but even though highly Americanized, life in Israel is not like in the USA. On the cultural level, it is Europe that dominates. In this situation, what is the place of Jewish identity? One of the reasons for the conflict with our neighbors is our particularity. They know very well that we cannot assimilate into the region, whether because of the issues of the rights of women, the exercise of individual liberties and many others. If we had to live in peace and contacts between the populations intensified, I do not believe our identity would be in danger. Quite the opposite, our neighbors fear, perhaps rightly, that our life style may take hold in their countries, which they really do not want. But if I observe what is happening within the education system in America, drugs and violence threaten in the medium term to destroy the schools there, and I do not think we need go down that path. There can be no doubt that we must be open to the world, particularly at the cultural level, and it is true to say that in this field it is Europe that provides us the most. In parallel, each one of us and the State itself must retain a specifically and clearly Jewish identity, in order to exclude any sort of isolation. There is only one way to achieve this: maintaining the Jewish family unit, marriage only between Jews, the proliferation of Jewish homes, and the durability of what I would call “our kind and our traditions”, namely Judaism. Being open to the world means a certain prudence. In addition, our religion has charged us with an extremely important mission, for we are the “ambassadors” of the Eternal on earth. This confers no privileges, but rather an impressive number of obligations, the first of which is to behave correctly. When one of us does something wrong, it is not at him that a finger is pointed, but at the “Jews”. Our religion prohibits us from taking the name of the Eternal in vain. The concept of Hillul Hashem, desecrating the Eternal’s name, is balanced by Kiddush Hashem, the sanctification of G-d’s name. This is something integral to our identity, and that must be progressively integrated into our Israeli identity. Incidentally, this idea can be found in a large proportion of Israeli society, which is non-religious but follows Jewish values, in particular in ethical matters, as well as now in a certain life style. In Israel there is no law that prescribes circumcision, no law that stipulates the seven days of mourning (shiva), and there is certainly no law requiring celebration of the Passover Seder, and yet despite that, over 90% of the population observer these traditions. In conclusion, I would say that it is true that we are engaged in a major and fundamental debate about Jewish identity in Israel, but in parallel we have achieved a certain equilibrium that allows us, for the time being, to live in harmony. We live in an age when people need an identity and roots in order to find hope. We must take particular care that overly religious or anti-religious movements do not seize the initiative and alienate those who want to live their Jewish identity in the balanced way I have discussed: being fully informed and open to the world. Happily, there exists today in Israel and in the world a new movement of thought and action that is gaining importance, that does everything to promote this approach. It consists of a group of young rabbis, poets, musicians, comedians, satirists and filmmakers who have very good university and Jewish education, who are cultured, and who by their openness address every sector of society. They live according to that ancient idea, “I am a Jew, but nothing human is strange to me”. The poets in the group write Israeli poetry based on Jewish roots, but at the same time they are to be found in the army and in academe. It is this type of Jewish and Israeli identity that, in the long run, will ensure the continuity of the Jewish character of the State, which in no way means that other currents will not be able to express themselves freely.